Sold by Appario Retail Private Ltd (4.7 out of 5 | 151,637 ratings) and Fulfilled by Amazon. Gift-wrap available. Taishan D03K is a digital audio analog converter. 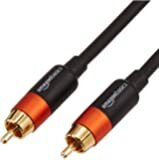 Which can transfer digital audio (Optical Coaxial) to two channels analog audio and output (But using directly on headphones is not recommended). 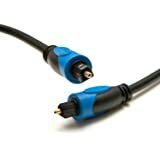 Just suitable for using together with device such as digital television - CD/DVD/Blue-ray player etc. 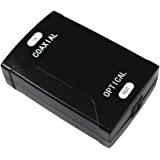 with which coaxial or optical digital signal output. 1. Support 192Khz/24bit audio signal. 3. Two sound channels stereo RCA audio output. 4. Standard 3.5mm sound output. 6. MINI USB power supply port. 7. Support PCM format, don’t support Dolby and DTS format. When using WLAN headphones in the living room, customers feel confused that transmitter of wireless headphone can’t connect with the TV, which lies in the different connectors of these two equipments. The common connectors of the transmitter is 3.5 mm analog input, whereas many digital TVs don’t have analog output connectors. In this condition, of course we need something to transform it - FiiO D03K has this function. 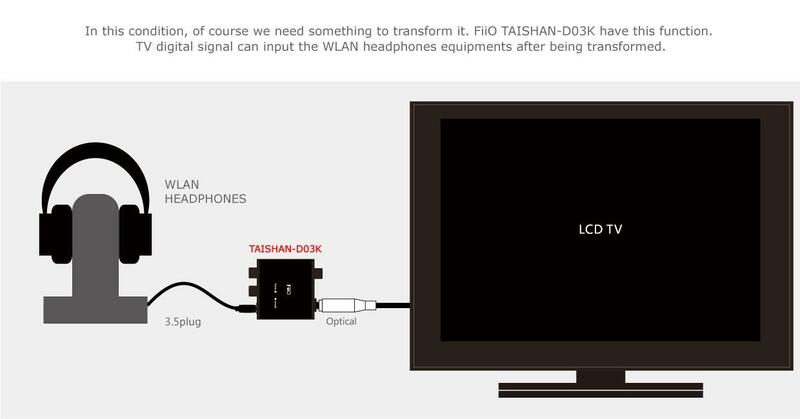 TV digital signal can input the WLAN headphones equipments after being transferred. 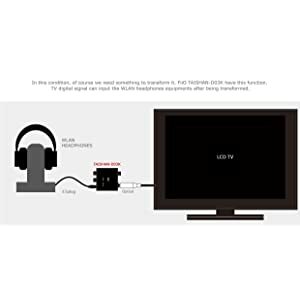 I had LG 32” TV until few months back and connecting through 3.5 mm audio output of TV, I was using Sennheiser RS110 wireless audio transmitter with headphone. I enjoyed listening to music and movies and other programs after my wife goes to bed at night. I was fully satisfied with this arrangement as the music can be heard BOTH in TV speaker and my Sennheiser headphone when my wife also watches TV, with independent control of volume level. Last month bought SONY 43W800D SMART TV expecting that I can continue to enjoy the above facility. Unfortunately to my disappointment, SONY has only optical output and no independent 3.5 inch audio output. After searching SONY and other websites, I found out that present generation SMART TVs do not provide audio output. I don’t understand why advancing technology should mean cutting down old features and facilities. (I will be happy to hear from other people who have knowledge about why this feature is removed in SMART TV). 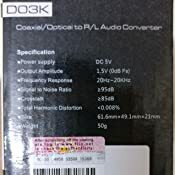 As I am having hearing deficiency as a senior citizen with TV speaker sound, I was longing to get solution like my previous LG setup. 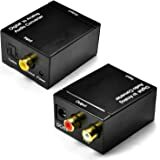 Some reviewers in amazon.in were sceptical that if optical output is connected to this DAC, main TV speaker volume will be cut off. One reviewer in amazon.com however, had exactly like my requirement of sound in BOTH headphone and TV speaker. He said this DAC converter is good solution. So, straightaway I ordered this. I connected as per instruction and to my surprise, the sound from the headphone is better than my earlier LG setup, maybe because this is from optical output which is of superior quality than analogue 3.5 mm audio output of my earlier LG TV. I recommend to people who have need like me to go ahead and use this device. Except that it is expensive (this FiiO DAC is almost twice the price of other DACs) it is totally satisfactory. 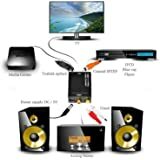 I'm worried about how to connect to my F&D t200x speakers to my Mi Tv 4A 43 inch. But it does excellent. Superb quality. Excellent woking. Very comfortable to my Mi TV 4A 43 Inch. Thanks to Amazon. 4.0 out of 5 starsNice budget DAC for basic use ! 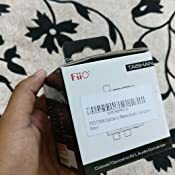 Thanks to amazon and the seller 'origin shop' for selling a genuine product. 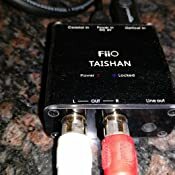 Checked the genuineness of the product on by entering the scratch code on the fiio's website. You get a power brick, some documents along with the DAC in the box. This DAC is working properly. I am writing this review after 3-4 weeks of usage. 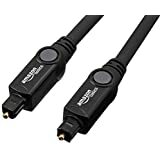 i have a simple setup at home and ordered a toslink cable along with it to connect it with my LED tv. It supports PCM only and the output on both RCA out and 3.5 mm stereo out is good. 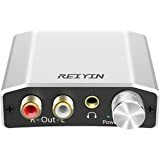 Its a good budget DAC for the price and i am happy with it. 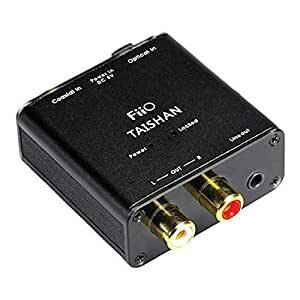 Excellent product..Have used it to connect the optical audio out of my LG TV with my 2.1 speaker system. The audio quality is even better than the rca audio out of my tata sky hd box which tends to dull out the treble.. Excellent DAC...Does not decode Dolby Digital audio..but that's not expected at this price point. This is a GEM. 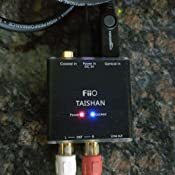 All those who wish to have an audiophile system with a stereo amplifier and a low cost DVD player, can connect the inputs of this DAC to the digital output of their DVD player, and the analog inputs of their amplifier to the output of this DAC. The sound is ruler flat and detailed. What can I say more? Just excellent. Good build quality. 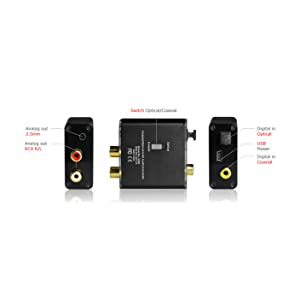 Connected easily and gives a good audio output. 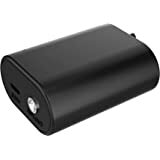 Can be powered from the TV USB connector also. 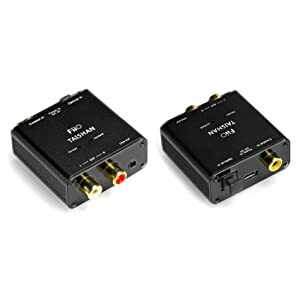 I am using it to connect the Digital Optical out from my TV to the 3.5mm input for my wireless headphone unit. 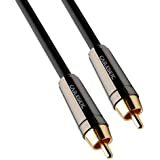 Toslink cable needs to be purchased separately. I have an excellent Sony Mini-HiFi which is quite old. So, didn't have digital audio input. My TV has only digital audio out. This DAC converter saved the day otherwise I had to replace the music system. Fiio DAC does what it is supposed to do. Sound is clear and volume doesn't drop. Definitely much much better than headphone jack output. Overall a good purchase. Giving 4 stars because Amazon bundled a microUSB cable instead of a miniUSB cable that this DAC needs. It is a packaging error. I had to dig my old cables to find a miniUSB cable.